$9.00 Soviet Army Pilotka Side Cap, High Quality REPRODUCTION. Includes correct, original Soviet era cap star. Size 60 (US 7 ½ - EXTRA LARGE). 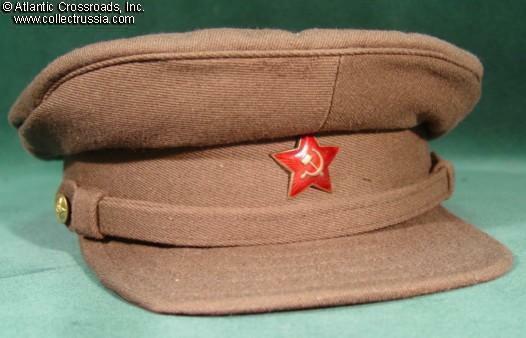 $9.00 Soviet Army Pilotka Side Cap, High Quality REPRODUCTION. Includes correct, original Soviet era cap star. Size 58 (US 7 ¼ - LARGE). $90.00 M 1931 NKVD Budyonovka Cloth Helmet, historically accurate, well-made REPRDUCTION. Currently available in size 59-60. $50.00 Paratrooper helmet in black leather, High Quality REPRODUCTION of a WW2 model. Size 58. In unissued condition with minor shelf wear to the leather.